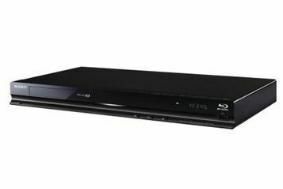 CES 2011: Sony Blu-ray systems go big on 3D and web connectivity | What Hi-Fi? There are three new BD players for 2011: BDP-S380, BDP-S480 and BDP-S580. The entry-level model is 2D only, but still has internet and USB connectivity, while the two other models are both 3D-ready, the 'S580 having the added advantage of wi-fi. You can add wi-fi capability to the 'S380 with an optional USB adapter. All three models allow you to stream content on demand from Bravia Internet Video, and give access to Sony's Qriocity service which allows you to view films and listen to six million songs. Also announced here in Vegas was the flagship BDP-S780 with Skype video conferencing and Homeshare wi-fi network capability, but this model has still to be confirmed for the UK. You'll be able to find out more about the 'S780 and the rest of the range in our Live Forum chat with Sony's Eric Kingdon later today. For 2011 all Sony's Blu-ray home cinema systems are 3D-ready out of the box. The line-up comprises BDV-E280, BDV-E380, BDV-E880 and BDV-E780W. The latter three have '3D surround sound' technology, while the 'E780W has built-in wi-fi and wireless rear speakers for added convenience. The systems also feature improved iPod/iPhone docking, and there are free iPhone and Android apps to turn your smartphone into a Sony-compatible remote control.